George, the 2nd born Son of Lawrence Aconley (York) & Alice nee Daniels (Old Malton), spent the first 6 years of his life living in Kirk Hammerton, where his Father was the village postman. In 1933 the family moved to 90 Rose Street, York then later to 19 Wigginton Terrace, York and George attended Park Grove School. Always wanting to wear a uniform he became a Cub then a Scout before joining the Sea Cadets at their Headquarters on Lord Mayor's Walk in the City, he then became a member of the St John's Ambulance Brigade. and Mother behind 90 Rose Street York. 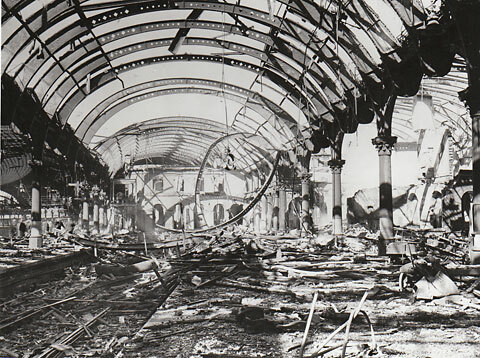 During the first bombing raid on York, 11th August 1940, George's Brothers and Sisters sought refuge under the stairs whilst his Mother and Father stayed in the living room. In the confusion George had managed to slip away and ran to the City centre to offer help to the Fire Service, after this experience he volunteered as a messenger with the Auxilliary Fire Service (A.F.S. ), their station was adjoining the York Rugby League ground on Wigginton Road. On 10th July 1940 George became a fitters apprentice at London & North Eastern Railway in York. 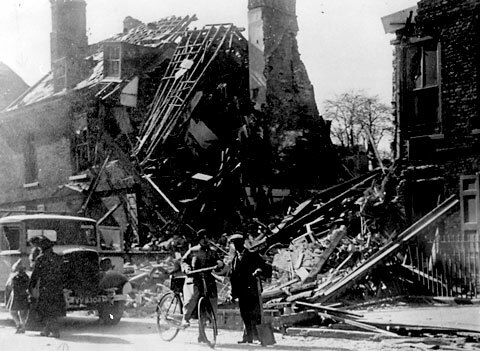 Early on the morning of 29th Apr 1942 the family were shaken from their beds by a bomb that had demolished a shop on the corner of Rose Street and Wigginton Terrace, 4 doors from his home. After the air raid warning had silenced George reported, with his bicycle, for duty. Later that day he arrived home with his bike punctured and by a circuitous route as the area of his home had been evacuated and cordoned off as the 1,000lb bomb was unexploded (U.X.B.). 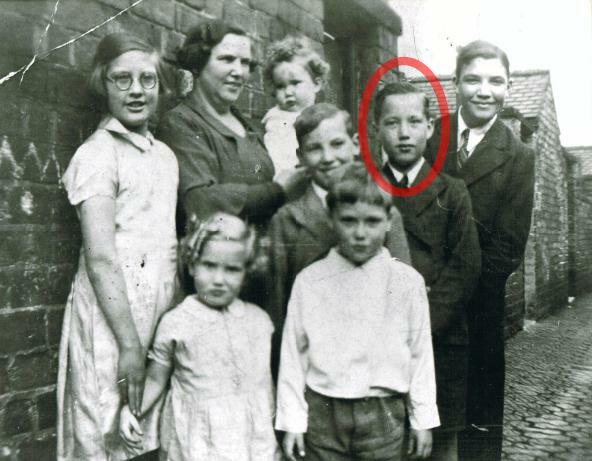 The family was spread around relatives, George going to his Aunt Ethel's in Thorganby, his parents went to a rest centre in the Dining Block on Haxby Road supplied by Rowntree's (R & Co Ltd). As telephones were less common in those days it was up to the Police to return everyone to their homes when the bomb had been recovered. His elder brother John (Jack) had already enlisted in the The Black Watch and George was eager to follow him so a day after his 17th Birthday he went to No 68 Recruiting Centre in York and after giving a false date of Birth and occupation was enlisted on 27th May 1943. 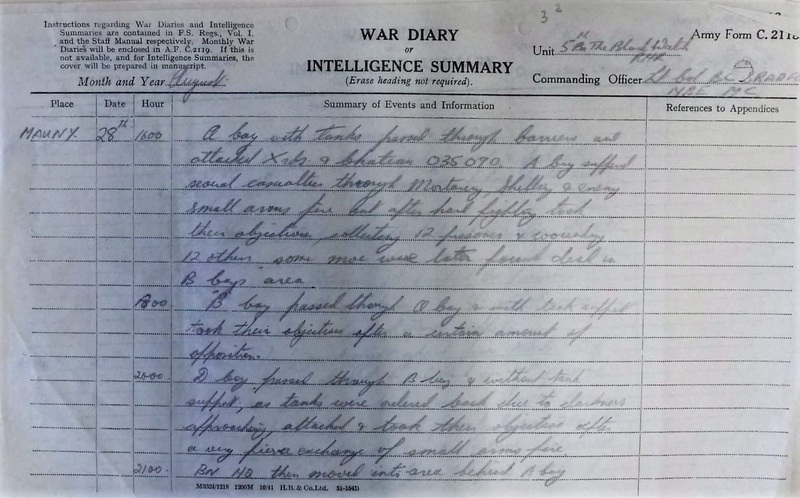 George was then posted to No 58 Primary Training Wing at Queen's Barracks, Perth, Scotland on 28th May 1943 and then on to No 8 Infantry Training Centre at the same Barracks. 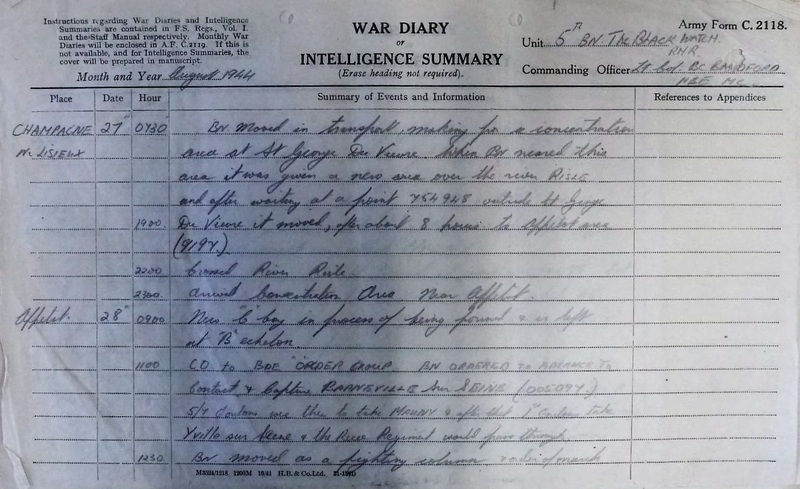 After training he was transferred to The Black Watch on 12th Aug then on to the 4th Battalion Black Watch on 6th Nov. At some time between 6th Nov and 28th Aug 1944 he was transferred to the 5th Battalion, it is suspected that this was on deployment to France on 20th August 1944 but cannot be confirmed. He landed on Juno beach on the 20th August 1944, prior to this the Battalion had suffered heavy losses in previous days at Breville. They pushed on to Ranville to the East of the river Orne where they engaged the Germans for several hours. On the 26th June they took part in a major assault on Caen before taking over from the 5th Seaforths in St Honorine la Chardronette 1 mile from Colombelles. On the 7th July they moved to the North East corner of a factory in Colombelles to secure the crossroads, the factory's two chimneys were to be blown as they were being used by the Germans to view the Allies progress. 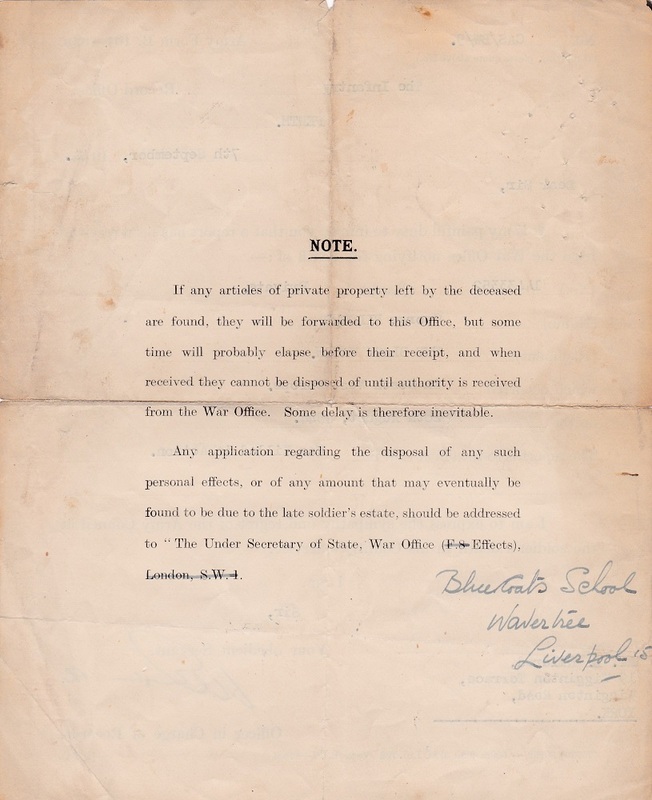 By the 11th July the factory was still in German hands and the Battalion had lost some 25% during the battle, a decision was then made to withdraw. On the 12th they took over from the Devon Regiment in Ranville and subsequently arrived at the rest area at St Aubin d'Arquenay. After a rest they moved to Anguerny to prepare for the next phase, the 51st had gained much respect after Colombelles and joined the 2nd Canadian Corps. On the 6th August they were moved, by RASC troop carriers, through the Caen Column and marched from there on to Bourguebus. 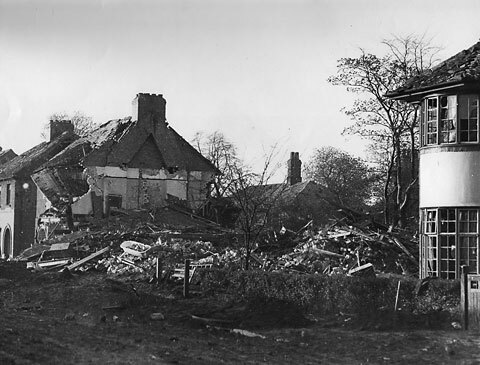 After several hours La Hogue was taken on the 9th August following heavy bombing by the RAF, on the 10th they took over fighting for St Sylvain from the Polish. The 14th August saw the Battalion in a daylight battle in Le Bu sur Rouvres where they took 200 prisoners, they then cleaned up and moved on to Percy en Auge where they came across booby traps which accounted for one member of the Battalion. 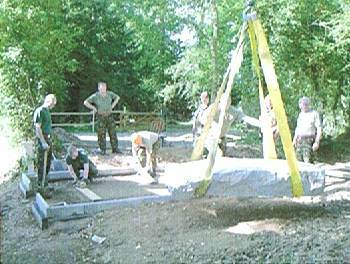 On the 17th they planned to cross the river Dives to the East of Ecajul but the bridge at Ouville had been blown and the nearest was 3 miles up river at St Pierre sur Dives so they cleared the village of Le Buhot and constructed a pontoon bridge across the river. Despite heavy rainfall they marched on to meet their transport which was to take them North East towards Lisieux. 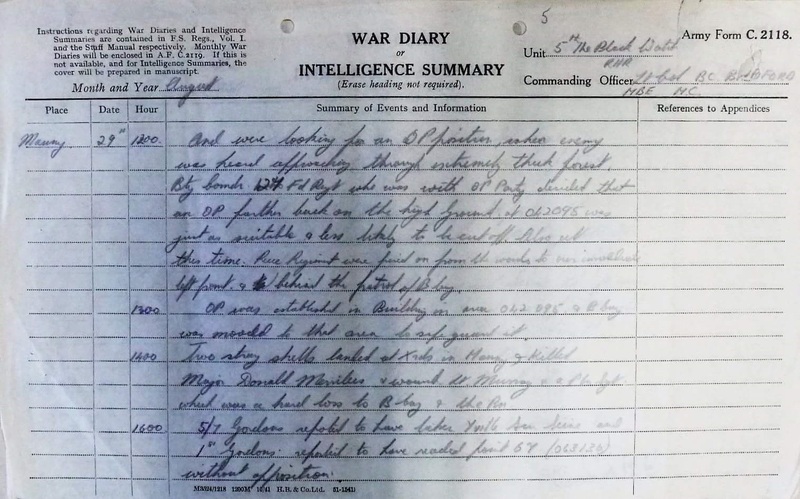 George arrived in France on 20th Aug 1944, the 22nd August saw the enemy withdrawing Eastwards and the Battalion pressed forward. On the 23rd they took over from 5/7th Gordons who had been fighting through Lisieux, after another night of heavy rainfall the roads were cleared and they rested for 48 hours 2 miles East of the town. On the 28th August they set off in transport to Bourg Achard, Barneville sur Saine was cleared of the enemy and they planned to capture Mauny. 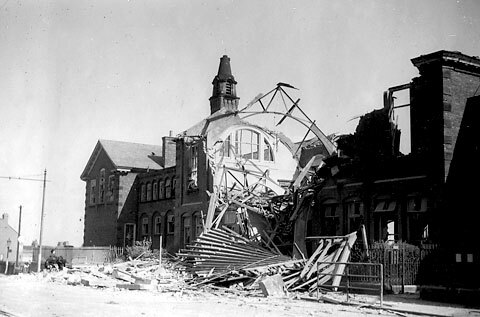 They were shelled in an orchard near to the crossroads and moved on to the Chateau. Still under heavy fire they stormed the building finding the cellars full of refugees and the Germans upstairs. 'B' Company led by Major Donald Mirrielees came through 'C' Company after a fierce fight in the woods, it's during that fight in the woods that George lost his life to a fatal bullet wound See Update. The action ended on 2nd September when the Battalion crossed the river Seine. 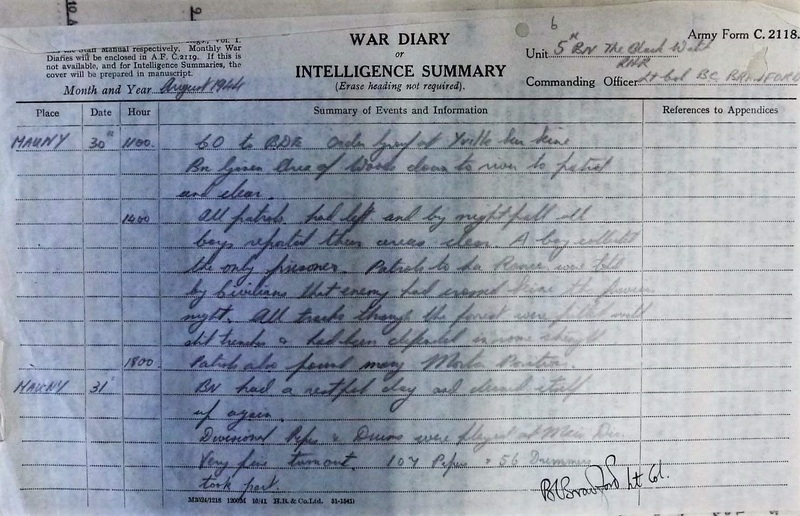 6 men died, 1 Major, 4 N.C.O's and 1 Private 14433352 George Hildred aged 18. Donald Mirrielees, James O'Keefe, Harry Billington and George Hildred were buried at the nearby Casualty Clearing Centre, their bodies were later exhumed and finally laid to rest at St Desir cemetery. 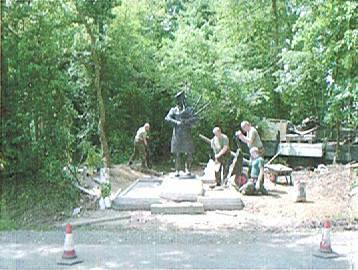 The good people of Bourg Achard and the surrounding area erected a memorial to George and his comrades. 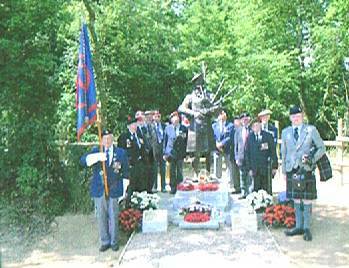 The memorial stands at the Haut Croth crossroads where the Casualty Clearing Centre was erected prior to the action. 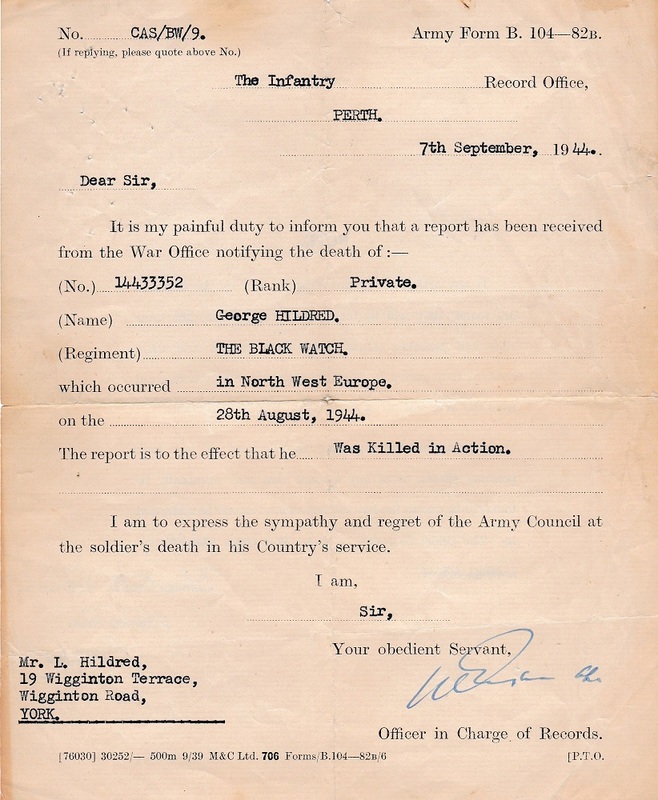 Although a request was made for his medals to be forwarded on to the family these were sadly never received. 1939-45 Star. The 1939-1945 Star is the first in a series of eight campaign stars instituted in 1945 to recognise service in the Second World War. It was awarded for six months service in specified operational areas. 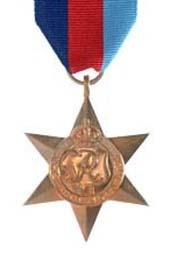 Those whose service was shortened by death, injury or capture or who were awarded a decoration or mention in despatches also qualified for the medal. This bronze six-pointed star has a circular centre with the GRI/VI monogram, surmounted by the Royal crown, and inscribed 'The 1939-1945 Star'. The star has a height of 44mm and maximum width of 38mm. The 1939-1945 Star was issued unengraved to New Zealand service persons, as were other Second World War campaign medals awarded for service for New Zealand. The same no-engraving policy was applied by other British Commonwealth countries, except for Australia and South Africa. The ribbon has equal stripes of dark blue, red and light blue, symbolising the Navy, Army and Air Force, respectively. 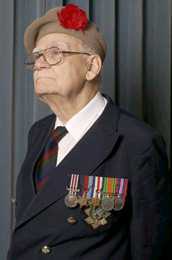 One clasp, ‘Battle of Britain’ was awarded for aircrew who saw service during the Battle of Britain in 1940. France and Germany Star. 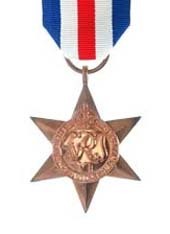 The France and Germany Star was awarded for service in France, Belgium, the Netherlands, Germany and adjacent sea areas between 6 June 1944 and 8 May 1945. This bronze six-pointed star has a circular centre with the GRI/VI monogram, surmounted by the Royal crown, and inscribed 'The France and Germany Star'. The star has a height of 44mm and maximum width of 38mm. Personnel qualifying for both the France and Germany Star and the Atlantic Star were awarded the first star they qualified for, and a clasp in respect of the second star. The ribbon has five equal stripes of blue, white, red, white and blue. These colours are the national colours of the United Kingdom, France and the Netherlands. 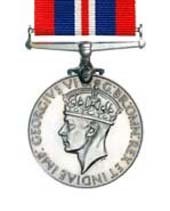 One clasp, ‘Atlantic’ was awarded with this medal. War Medal 1939-45 (obverse and reverse). 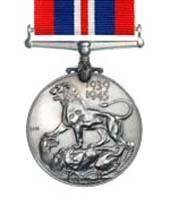 This medal was awarded to all fulltime members of the Armed Forces for 28 days service between September 1939 and September 1945 irrespective of where they were serving. received by many families who suffered a loss. 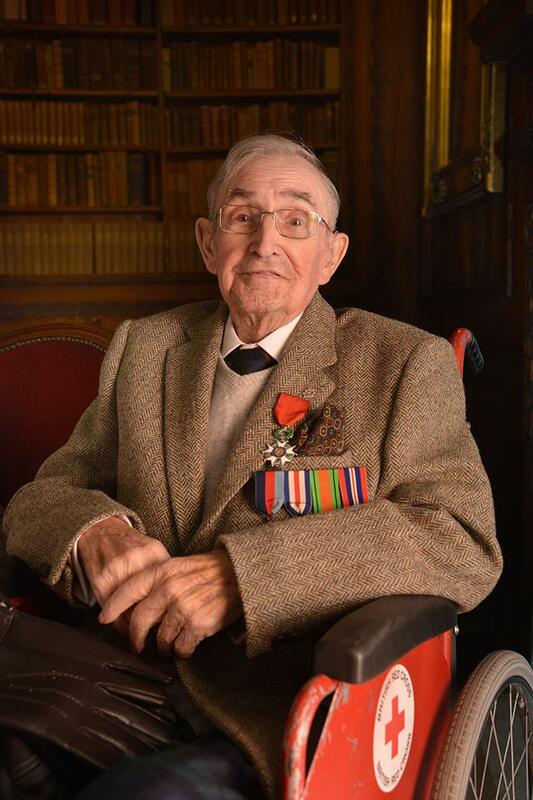 We were contacted by Gus Brydon (Son of Private George Brydon) although wounded his Father survived and in 2016 was awarded the 'Legion of Honour' in Edinburgh Castle presented by the French Ambassador, George wanted to mention that the medal wasn't just for him, but to all the soldiers who didn't return home. 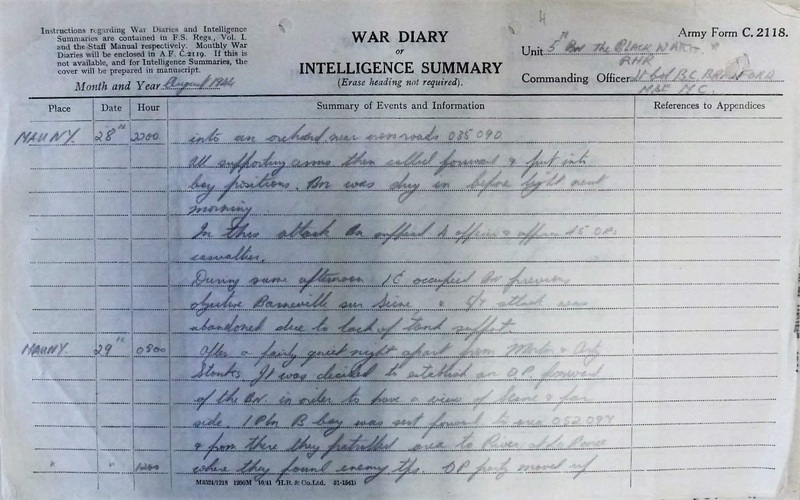 Private Brydon landed in France on the 29th of July to join 'B' Company. It seems that George Hildred was fatally wounded on the 28th August at the same road block ambush where Tom Renouf was also wounded and not as previously thought, in the grounds of Chateau Mauny. The Company had approached a temporary German** road block made from felled trees, George was climbing over one of the felled trees when he received his fatal bullet wound! 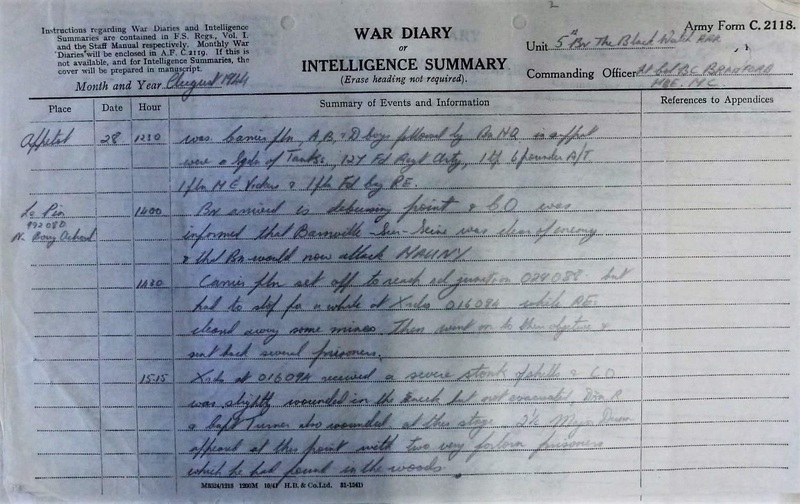 Gus asked his Father if he is sure about the rank of the soldier shot a metre away from him and he confirmed that he was the same rank as himself, a Private (The only Private to die on the 28th was George Hildred). On the 29th 'B' Company advanced once again to the road block where his body still lay and proceeded in the direction of the Chateau. at the crossroads at the South West corner of the grounds Major Mirrielees and the other Officers were planning encircling the Chateau when all hell let loose and mortars started raining down on the group from the Chateau grounds near the house. Private Brydon was standing quite close to the Major and turned to run and dive into a ditch, but was hit and blown clear into bushes, where he lay still until the bombardment, which lasted about 10 minutes with heavy machine gun fire coming from the tree line perimeter of the Chateau ended. Shortly after, the British tanks started up and headed across the fields to attack the Chateau defences. 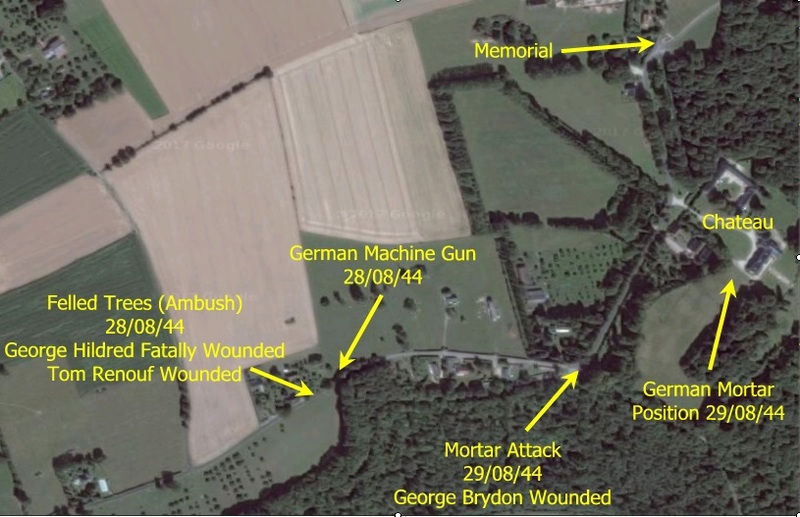 It was then that Private Brydon was reached by a Field Medic and carried away to safety, he couldn't walk to the 'medical caravan' that was set up on the outskirts of the village and was eventually carried to Bayeux on a stretcher across a Jeep. ** The German troops that ambushed 'B' Company at the felled trees were remnants of the elite 12th SS Panzer Division Hitlerjudend, commanded by Kurt (Panzer) Meyer. This Division managed to escape from the Falaise gap when the Allies decimated the Wermacht in early August and had the Germans on the run. These were seasoned troops, who had fought on the Eastern Front. Kurt Meyer was captured by the Belgian resistance in early September '44 and was convicted of war crimes against the Canadian troops on 7th June 1944. He served his sentence in Canada and died a free man in 1961 in Germany. This is the area where Tom Renouf said the road was blocked by felled trees, we found the stump of a very old tree and although we will never be 100% certain have placed a cross here to mark the spot were we believe George died. Undated article written by Lieutenant Dr Tom Renouf, who served with the 5th Battalion The Black Watch of the 51st Highland Division. 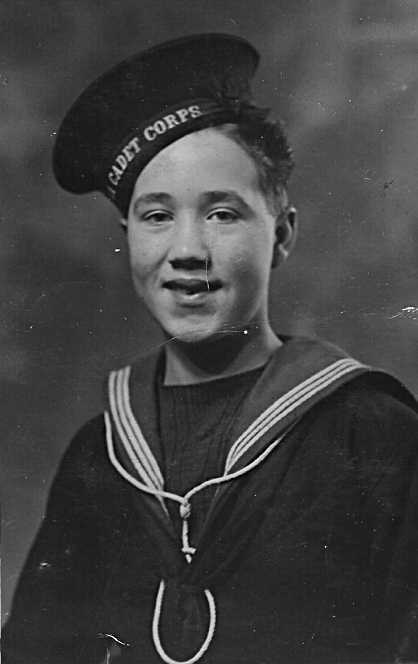 Tom Renouf was a newly enlisted 19-year-old soldier when he landed on Sword beach on D-Day plus two. It seems that as you grow older, those memories that do not fade start to get stronger. For me there is one that, over the past forty odd years keeps creeping back from the dark shadows of my mind bringing with it a clear and vivid image. Today it seems to come into my thoughts more often than it did in the past, and I feel there is a sort of pressure on me to put the memory into words. Each time I hear the tune Je t’endrais and the memories that are linked to it, I am taken back over the years to the events of a day in August 1944. 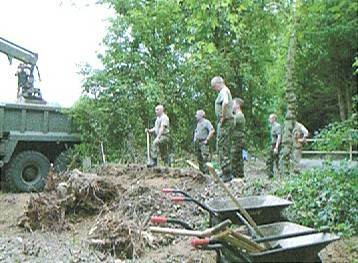 After the battles of the Normandy campaign, many of the fighting units were so badly depleted that an amount of re-organisation was necessary. As a result of this I was transferred from the Tyneside Scottish to the Fifth Battalion of the Black Watch. For the first time I found myself in the same section of 7 platoon as my buddy, Alex Corris, from the Isle of Man. We had joined the army on the same day and although our paths had diverged on occasions, we were and still remain very close friends. I remember thinking. that I did not, want to be this close to Alex possibly because of a superstition concerning the ill fate of close friends. The battalion had just liberated a part of Lisieux, the Germans we were told, were “on the run” and we were having two days rest. I remember the sheer exhaustion and battle weariness that showed on the faces of my new comrades. The battalion was battle seasoned, it had fought its way from El Alamein and despite heavy casualties, there were still a few of its number that wore the much respected Africa Star. 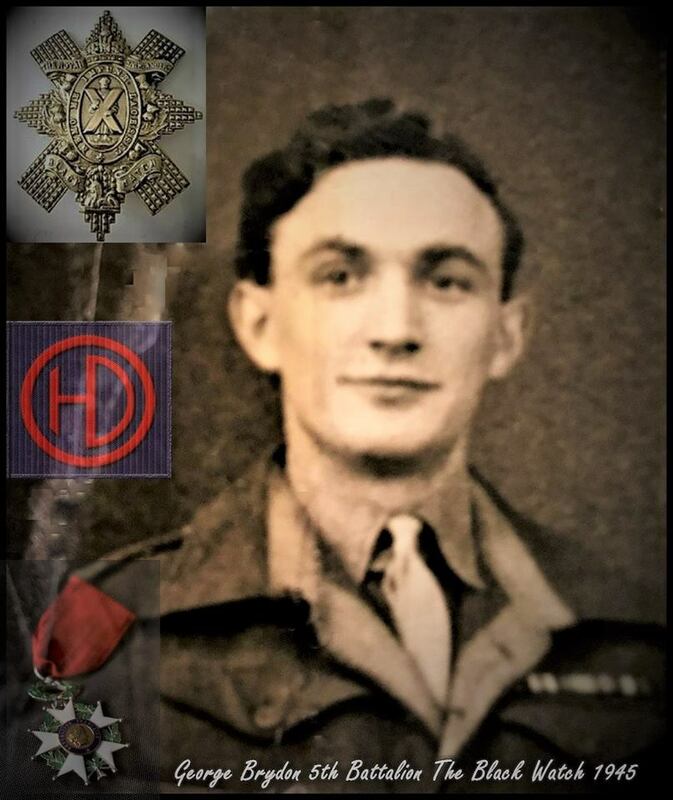 My new section leader was Corporal Chapman, both he and Ginger (Sargeant Thomas Kirkcaldy) wore the much respected medal, but the rest of us were 19 year old and veterans only of the Normandy battles. Chapman was a fine soldier and won our confidence and respect immediately. He was an efficient but a kindly person, neat and smart in his turn out but very understanding. He looked after us new veterans like Father figure, but at the same time controlled us as a fighting unit. Ginger, as he was affectionately known was friendly and well liked by everyone. He had a rare quality that was seldom to be found or shown by soldiers. When he spoke to you, it was like speaking to an older brother. He was most concerned about your well being and intently interested in everything about you. As a result of this, he seemed to enjoy a close personal relationship with everyone, even the hardest of men and I am sure many confided in him. He would be sure to ask if things were alright, or how the family were getting on, or if you were getting letters, etc. From the start, he welcomed us with great kindness, gave us a lot of help in settling in and established this close relationship with us all. After two days, our rest period was over and we moved out, carried by lorries, back to the combat area. The battalion’s task was to mop up a pocket of resistance left behind by the retreating enemy to delay our advance. The pocket was on the nearside of the Seine in country that was hilly and lightly wooded and very different from the bocage of Normandy. As we advanced towards the battalions objective, there was little evidence of enemy presence. After a halt, Corporal Chapman told us that the leading company had taken all the objectives unopposed and that there was no sign of enemy troops. He also told us that the second objective had been given and that another company was leading the attack. This objective was taken and still no signs of resistance. After various ‘O’ group meetings, a third objective was announced and this time it was our company that was leading. We also learned that our platoon was leading the company, and our section, under Corporal Chapman, leading the whole attack. Every infantryman knows that the leading section was exposed to all risks, that the chances of being a casualty were very high and that your fate was in the hands of God. On this occasion, however, our chances of survival seemed considerably improved since there was no sign of the enemy. We set off from a wooded area into undulating hill land. We moved forward, well spread out, looking all around for any threatening signs of hostility. There was no shelling, there were no sounds of the dreaded mortars and no sign of the enemy. It was a pleasant sunny day and the farther we moved the less we felt threatened. We traveled past a roadblock of felled trees and through a minefield of six or eight anti-tank mines laid in the road and easily identified. About 100 yards ahead of this there was another roadblock of felled trees and a wood just beyond. Perhaps we should have recognised the possible danger, but everything was so tranquil that we had become a little complacent. We approached the roadblock and just as we were climbing over the trees a burst of machine-gun fire opened up on us from the wood ten yards ahead. Instinctively, we moved like lightning. I found myself lying behind a sawn off tree stump. There was more fire, the bullets kicked up the earth first to the left then to the right of my tree stump, and I wriggled to keep out of the line of fire. When it stopped, we had time to think. It sounded like a Schmeisser hand machine gun almost certainly on the left. I went into my pouches for a grenade as I am sure the others did, but I found first a tin of sardines, then a tin of bully beef and eventually a grenade. Rather foolishly, we had given higher priority to the buckshee rations we had, for the first received than to our essential weapons. By this time, I had the feeling that the immediate danger was passed. I looked for Alex, he was crouched in a fold in the ground barely enough to afford protection. I shouted to him and he said he was alright. I then felt something hot running down my back and said to Alex, “I think I have been hit.” He very bravely crawled up to me, removed my pack and quietly said, “Tom, get back as quick as you can.” I can still remember concern and anxiety in his voice and this puzzled me because I felt quite well. I made my way back to the first aid post where I was examined by the Medical Officer and told to get into the Field Ambulance. I was shortly joined by two more walking wounded and after some time two stretcher cases were brought in. I was happy to be on my way back to hospital and out of the fighting , but I was badly shaken when I discovered that the two badly wounded cases were Corporal Chapman and Ginger. I did not know that they had been seriously wounded at the same time as I was. The ambulance set off for Bayeux about 100 kilometres away, a journey that was to take us well over 12 hours on account of the shell-pocked roads and the heavy traffic. We passed through four aid posts where we got essential medical treatment. Two of these were Canadian where we were given the best of attention and much kindness, and two were British where we were treated quite indifferently. It was the middle of the night when we arrived at the last of these aid posts. I knew that both Corporal Chapman and Ginger were seriously wounded and very weak. Neither of them had regained consciousness and there was little that we could do for them. When they were stretchered out of the ambulance and into the light of the reception tent, we feared the worst. The M.O. examined them and much to my grief pronounced both of them dead. This sad loss was made all the more tragic for me for two reasons. As I watched all of this going on, my thoughts were concerned only with the fate of my two comrades I was only vaguely aware of music coming from a nearby radio but then it suddenly struck me, the tune that was being played was Je t’endrais and then I remembered that this was Ginger’s favourite tune, it was being played as he passed away. I was also struck by the injustice and the strange quirks of fate. The two that had been killed in this attack were the two old soldiers, who had traveled far under the banner of good fortune and who, within sight of the final goal, had been taken by fate. I felt, that they, before any others in the section, deserved to see final victory. I went on to hospital in Bayeux and after a few weeks was back with 7 platoon I was greeted by my old pal Alex who had volunteered to become a stretcher bearer, one of the most dangerous jobs. He was glad to see me, it had been a bad day for casualties and he said he felt lucky to be alive. At that time there were many bad days and hard battles ahead of us. We were both fortunate enough to survive the war and at the end of it we found ourselves billetted in a beautiful little German village called Steyerberg. There were very few of us who had survived from the Normandy beaches but during these days we talked a great deal about the past, recalling various happenings and remembering the many who had not been as lucky as we and we often spoke of Corporal Chapman and Ginger, our two Africa Star comrades. We knew only too well the chances of survival for an infantryman. The chances of surviving from El Alamein to Berlin was practically nil, out of all the members of 7 platoon who had started at the beginning, only one was left at the end. He was our platoon sergeant and great friend, Wick, but en route he had been wounded twice. 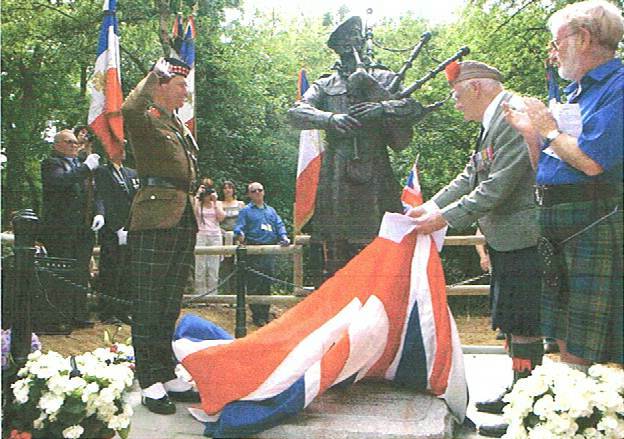 On the 10th June 1944 the Highland Division made it's first attack from The Bois De Monts towards Breville. In this and the action at Chateau St Come 110 men were killed in two days. Vastly outnumbered and against ferocious counter attacks the Highlanders helped to secure the Orne Bridgehead only by steadfast dedication, courage and sacrifice. 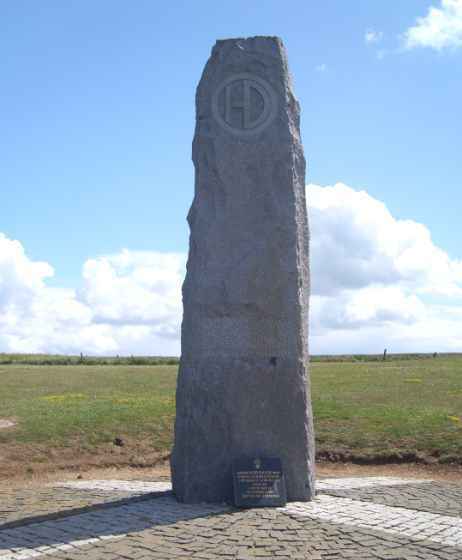 An impressive monument to this action has been erected just outside Breville, click here for it's location. 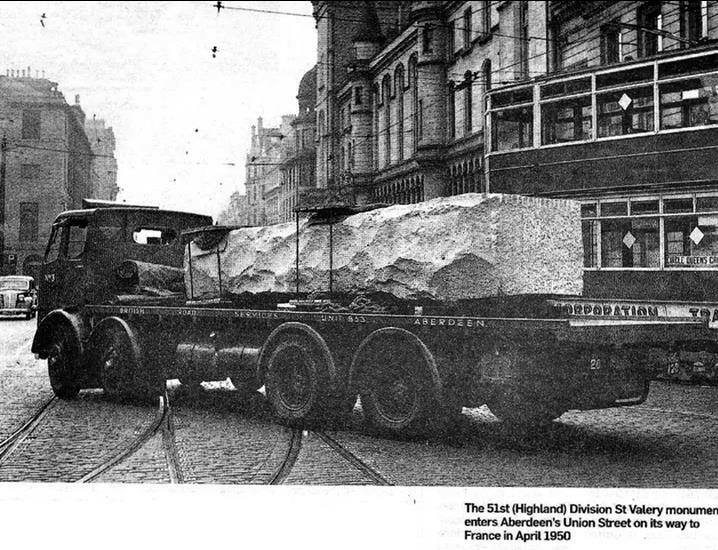 The Black Watch Monument was erected in 1950 and is made from a block of granite quarried near Balmoral. 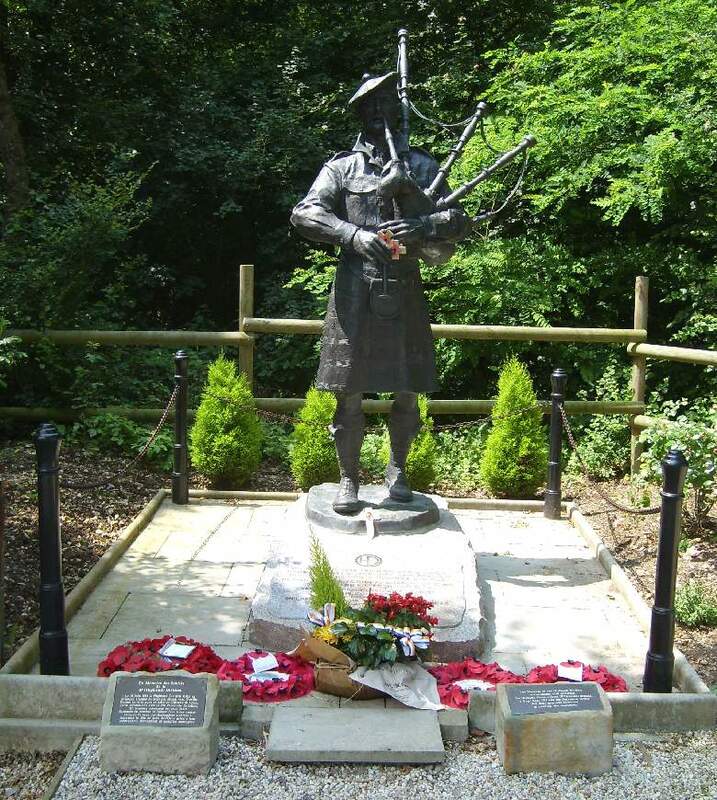 It is dedicated to all ranks of the 51st (Highland) Division who lost their lives between 1939/45. 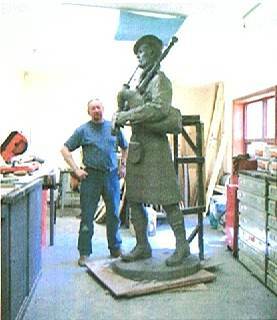 The eight-foot high piper which stands on a 10 foot granite block was sculpted by Alan Herriot and is a duplicate of the Normandy figure built for the 60th anniversary of the D-Day landings. Dr Tom Renouf said the monument is in honour of the five Highland regiments - the Gordons, the Camerons, the Argylls, the Seaforths and The Black Watch.